My husband and I have always had a love for traveling. In fact, I have been overseas at least once every year since I was 13! The travel bug isn't something you ever lose, so when we became parents our first thoughts were 'when will we travel?' as opposed to thinking that we could no longer see the world because traveling with kids was too scary. Don't get me wrong, we were very hesitant. But our love for exploring (and the fact that my husband is from Scotland and his family still live there) meant we were eager to find a way to make family travel fun and exciting. Since having our daughter, Ayla, we have traveled all over the world - Perth, Melbourne, Sydney, Tasmania, Thailand, Scotland, London, Bath, Dubai, Abu Dhabi and soon we will venture to Spain, Italy and France - so we have developed some tips and tricks for surviving! The first thing you need to do is accept that it might be a little uncomfortable, especially if you are doing a long haul flight. But in the scheme of things, it's only about 24 hours until you reach your destination. * Pack enough nappies in case you are delayed. * iPad & headphones for toddlers! 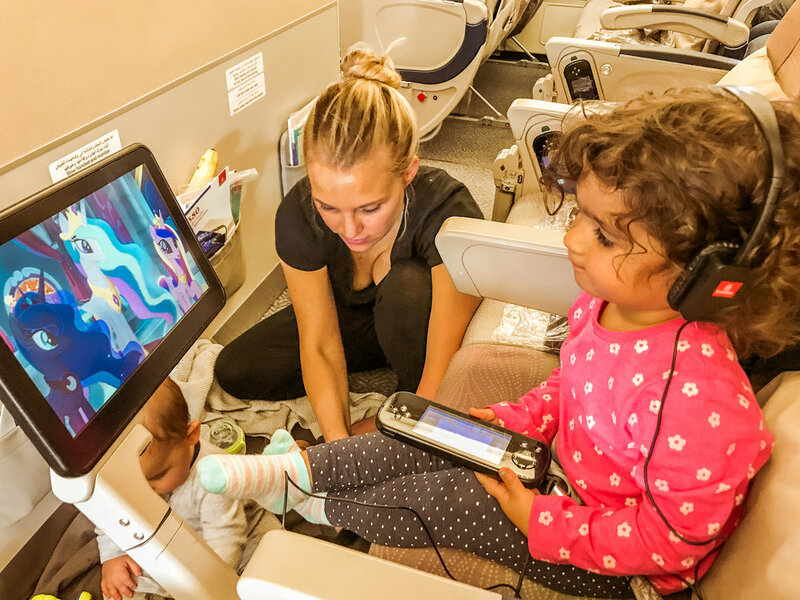 Yes to screen time on planes! This saved our sanity and kept my daughter (2.5) happy and entertained. She has kids headphones from JBL. Make sure you download movies and cartoons that your child likes - also helps if you get delayed at the airport! * Activities - a great idea is to take some blu-tak and paddle pop sticks in a zip lock bag, great for toddlers, they can stick them all over their seat and it won't damage anything like stickers can. 3. A baby carrier / sling - Getting in and out and through airports with kids isn't easy, so I always use a carrier. We have never taken our pram to the gate, instead choosing to check it in as luggage. This means I carry Reza and my husband carriers Ayla. Most international airports do have prams/strollers that you can use for free or hire. 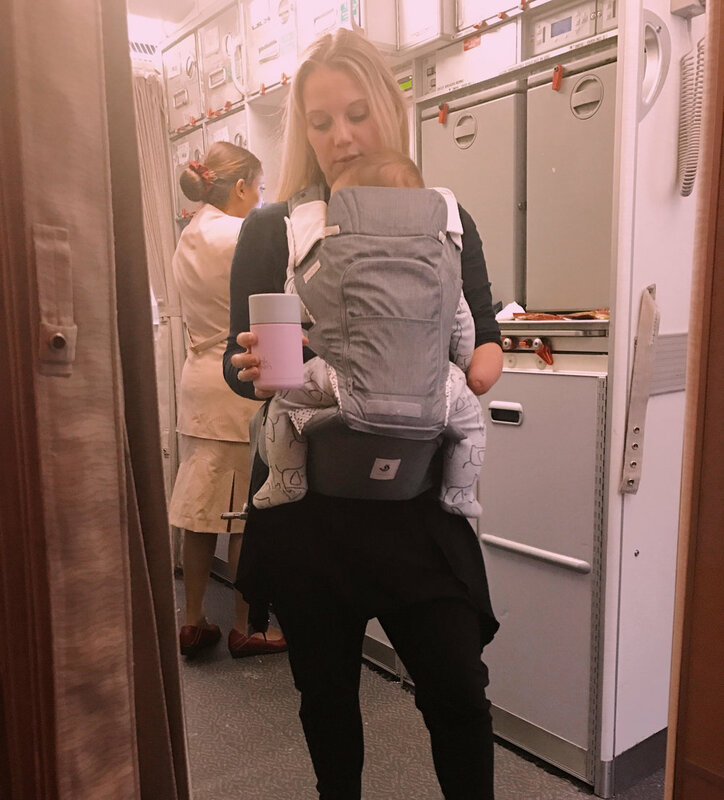 The great thing about the baby carrier is that my kids always sleep in it - so once we are up in the air and it's time for them to sleep I put them in the carrier. It's also much easier for me because I can then sit down and not worry if I dose off because I know he is safe - any time my kids fall asleep in my arms I can't relax, it's also really uncomfortable. 5. Try to book flights that correspond with when your child sleeps - so for shorted flights, try to book then when you kids usually sleep. And for long haul flights, try to book night flights. Most kids will sleep on planes, if they are comfortable. 6. Have Fun - enjoy the moment and embrace the opportunity to show your kids the world! 7. Prepare for Jet Lag ... I'll write a post about that soon!